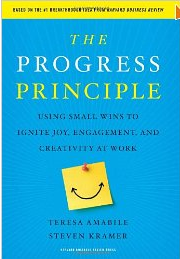 For this post I’m reviewing the Teresa Amabile @TeresaAmabile and Steven Kramer book titled The Progress Principle: Using Small Wins to Ignite Joy, Engagement, and Creativity at Work. Let me start about my background. I’ve been in a leadership position for over half of my career. That’s 11 years. Coupled with my Master of Arts in Strategic Communication and Leadership degree from Seton Hall University, I thought that I knew everything there is on how to motivate employees. The fact of the matter is that I had successes in forming and developing cohesive and high-performing teams throughout my career. So, when I offered to review the book, I was a bit skeptical that it would offer any new information that would be of value to me. The above list covers a lot of what people value that can help motivate them in the workplace. But as I read each of the chapters, it occurred to me that I’m missing one very important point, which is progress. The book highlights that the secret to amazing performance is meaningful work. Also, it refers to a concept called inner work life. For a moment I thought, it meant work/life balance, but later on I learned that inner work life is a rich and multifaceted phenomenon. It describes how inner work life influences people’s performance. It goes on to say that, no matter how good your overall strategy, the execution of it depends on the inner work life of your employees. Inner work life is noted in the book as the confluence of perceptions, emotions, and motivations that individuals experience as they react to everyday events of their work day. When people are happy and engaged, they can be creative. It can rise and fall and performance is also affected by it. When people are happy, they’ll more likely do the work. When people have a good inner work life, they can overcome hurdles and get the job done. In the book it talks about the findings on Zappos that promoting positive inner work life doesn’t only make people feel better, it also leads people to do better work. In my experience, having happy employees helps in delighting your customer. As manager/leader of our organization, the way we interact with our people can affect their inner work life and that has an effect in their performance and ultimately our organization’s ability to compete and deliver. Therefore, it is important to think about how my interactions, communications and decisions will affect the inner work life of my group. My main learning point is that the best way to motivate employees day in and day out is by facilitating progress. Even small wins can help move things in the right direction. If we feel that our work is valuable and we are successful, then we feel good about our work. This book does not just say what it is that can help improve our situation, but also provides a guide on how we can facilitate progress and the factors that we need to be aware of to make things happen. Continuous progress is the key to improving creating a good inner work life. Each small wins help build confidence to enable us to tackle the next challenge and build on top of the positive feeling that we had as we accomplished our goal. Setback is the opposite of progress, when something that happens at work at causes a negative effect on our inner work life, it will start affecting our work. And if we don’t do anything about it, we’ll start regressing and ultimately affect our ability to deliver or achieve our goal. From a personal perspective, I’m really glad that I volunteered to review this book, because I learned about the inner work life, its role in motivating people, and the importance of progress. More importantly, the awareness of the importance of inner work life and how to turn knowledge into action. I rate this book as 5-stars based on the value that readers can learn and its relevance to current setting. I highly recommend this book to everyone who leads others at any level of the organization. Sustaining a continuous cycle of progress and positive inner work life are key to companies’ ability to leapfrog against its counterpart. In the end, as leaders at any level, we have the responsibility to make sure that we do the right thing to help that company produce the best product or service. The right thing means we need to make sure that we provide an atmosphere that supports a positive inner work life that can facilitate progress. That step starts by buying this book and learning how we can turn knowledge into action. Previous Would You Let Your Gut Speak – In the Corporate World? Your review of “The Progress Principle” gave me two take-away thoughts: (1) Would coaching our teams to strengthen their resilience help them experience a consistently more positive inner work life? and (2) We, as leaders, shouldn’t forget to keep a pulse on our own inner work life, adjusting and nurturing it as needed, so we can be the best leaders we can be. Thank you for your review and highlighting the inner work life concept! You’re absolutely right about the leader maintaining a positive inner work life. It all start by making your house is in order. I’m glad I was offer to do the review of Teresa’s book. I’m thankful for the opportunity to learn this valuable lesson on progress. i read all of your posts as they are practcs oriented. Good luck.